Enugu State, on Monday shouted out over the capture of a priest, Reverend Kenneth Okafor. The priest, who was attached to Emmanuel Methodist Church, Ogbozinne, was arrested on Friday, September 14 by armed police operatives, said to be from the Federal Special Anti-Robbery Squad (F-SARS). The development was connected to the killing of the traditional ruler of Ogbozinne Akpugo, Igwe Steven Nwatu, by a mob made up of members of the community on June 11, 2018. The Methodist priest was reportedly billed to appear before a judicial panel of inquiry set up by the Enugu State Government over the Igwe’s killing on Monday, September 17, 2018. However, Okafor could not appear before the panel as planned as he was arrested and taken to an unidentified destination. 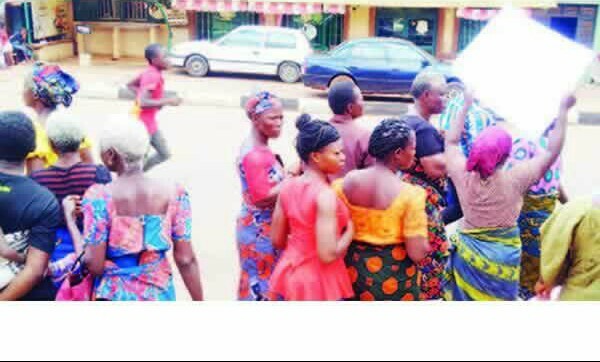 The female protesters, who marched through some streets in the Enugu metropolis, raised the alarm over what they described as the indiscriminate arrest and detention of members of the Ogbozinne Akpugo community by security agents over the monarch’s death. The Punch learnt that the village had been deserted, as many youths were arrested, while those who had not entered the police net had gone into hiding. It was also gathered that those being arrested were people perceived to be enemies of the murdered royal father, who was engaged in a running battle with some of his subjects, who sought to dethrone him before his death. The leader of the protesters, Mrs Rebecca Edeh, said only aged women and children were left in the village as a result of the siege to the community by security agents. She said the priest and other members of the community were arrested to stop them from testifying at the public hearing of the judicial panel of inquiry. Edeh explained that several Lagos-based businessmen from the community, who were members of the village’s town union, which was opposed to the late Igwe, had been arrested, while their shops and bank accounts had been sealed and frozen. “We are appealing for help. The security agents, who are said to be from Federal SARS, have been raiding our village; many of our people have been thrown into jail. “Our sons, who are businessmen, are no longer able to send us money because their shops and bank accounts have been sealed and frozen. We are starving to death; we don’t have money to buy our drugs. “The Methodist priest was arrested inside his church. He was supposed to testify, but he could no longer testify and at the moment, we don’t know his whereabouts,” the 75-year-old woman said. It was gathered that the priest was picked up on the church’s premises around 12.45pm on Friday by three security operatives. Some leaders of the community, said to be in the late Igwe’s camp, reportedly led the operatives to arrest the cleric. The Bishop of the Methodist Church, Agbani Diocese, Rt. Rev. Meregini, who confirmed the incident, told journalists that the whereabouts of the priest had yet to be known. However, spokesman for the Enugu State Police Command, Mr Ebere Amaraizu, told The Punch on Monday that he was not aware of the priest’s arrest.